It has been sorely missed, we eat every meal at home together at the dining room table. I'm happy to say it has finally been replaced by the newly-refinished table and chairs. Thank goodness, no more standing around the kitchen counters with our plates! I love the way the set turned out! I will post more about the table and chair 'redo' process this week, I'm just so happy to have it done. I do still have the two arm chairs to sand, prime, paint and recover (blech) and the french doors have to be painted, and the rug is not doing it for me anymore, but those will all have to wait a bit. Haven't they come a long way from this? More details on how I did it to come! Sorry for the weird shadows - we get next to no natural light in here, so I usually just take pics at night with the chandy on. Oh, to have a flash I can bounce off the ceiling! If only Christmas was coming up and someone had no idea what to get me! Heh. they came out wonderful! I am also loving your curtains. WOW! I am so glad you did not cover up the beautiful top of that table! Love the fabric you added to the chairs! Love how it all looks! When you tell us all how you accomplished this, can you also tell me how the heck you do all this painting when it's freezing out? It look sso great Sara! Great work! it looks amazing. i actually have chairs almost identical to yours! Wow! Awesome job Sara! Love the table! I'm so glad you went with that dark top. It looks great. Love, love, love! The new (old) dining set looks PERFECT in your dining room. The fabric on the chairs gives it a little flair, too. What a project! You should give yourself a good pat on the back, if you have't already. Wow, it looks gorgeous! It just makes the space sing! I have major dining room envy, great job! Beautiful .... love the stain on the table top. beautiful. that's about it!!!!! great job! It is beautiful! It looks like it was worth all of your hard work. It looks fabulous. I love love love the table top. Looks like it just "fits" in your dining room. And, I'm also loving your curtains. Never noticed them before. The round table looks so good in the room. Very nice job on the refurb. Just beautiful! I keep saying I'm going to tackle our gross dining room chairs, and maybe you have finally motivated me to do it! Absolutely beautiful! You've done a great job! Looks awesome! And you didn't even have to give up seating space, because you have the leaf. Very nice, lady. Kate - because I painted everything with a brush, I was able to paint it all in the dining room with plastic down. Thank goodness we got the table done before it got really cold out, because that involved spray lacquer and lots of sanding - not indoor activities! Wow, I either forgot or missed the part about you painting this by hand. Don't you have cats? How did you keep them away from the wet paint? Beautiful! Those turned out fantastic! I love the two-toned affect and that gorgeous fabric. You did a great job! Omg. The table and chairs look fabulous. I'm dying over them. They go so well in the dining room! It must be nice to have a place to eat again! Sara, your DR looks GORGEOUS! 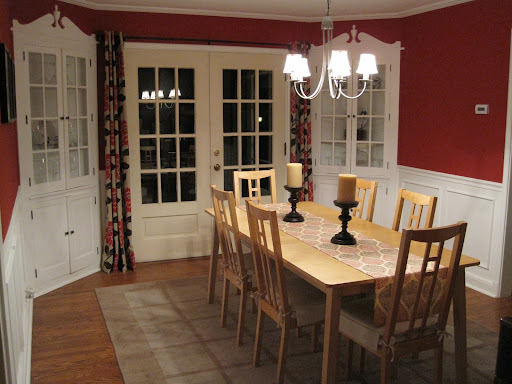 You've made black and red look fresh again - and I love how the table and chairs turned out! Good for you! Kate - I do have cats, and yes it's next to impossible to keep them away from the paint! It seems like they need to be around me even more when I'm painting, and the black cat has gotten the 'skunk' look several times with white paint. Oh well! The table looks great - I love that dark stain. And those french doors... awesome. Great job! It's amazing how a round table can transform the space. ROFL! I wouldn't worry about the skunk look as much as I would the paw & nose prints all over the piece I just painted. PS. Sure wish you had one of those "Subscribe to Comments plugin" thingies that Kitliz got for her blog. Hint, hint! You continue to reign as the fabric queen!! Those chairs are freaking adorable (you couldn't have chosen a more perfect fabric) and the curtains are to-die-for. I thought the setup was beautiful before and bam! You go and outdo yourself. Fabulous job once again!! Sara, it looks absolutely amazing. I am totally and completely jealous.